Winter is here. That means that it’s time to prepare your pipes for the cold weather. If you don’t, your pipes are at risk of freezing. When this happens, your pipes burst, and the result is serious water damage to your home. A small crack can result in 250 gallons of lost water everyday. This creates serious flooding, and the potential for structural damage and mold growth. 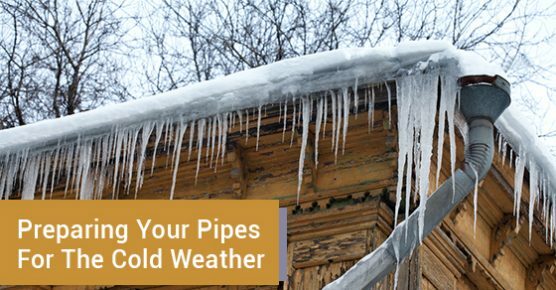 You probably have the basics down (like insulating pipes that are in unheated areas), but here are five more tips to prepare your pipes for the cold weather. The first step to prepare your pipes for the cold weather is to have your pipe system (including your backflow preventer) and water heater inspected. This ensures that your pipes and water heater are in good condition. This inspection will also ensure that your water heater is working as efficiently as possible. It is also very important to check for any air leaks that are located near your pipes, because even the smallest of openings can let in air that can cause your pipes to freeze. Good places to check include around any electrical wiring and dryer vents. If you notice any air leaks, seal them with caulk or insulation. You should also close all foundation vents and fill the openings with wood. If you have insulated pipes under your sink, you should open your cabinet doors to allow heat to more easily circulate underneath. This should be done once the temperature drops below freezing. If you’re going away, it’s important to do a couple of things beforehand. First, you should not set the thermostat lower than 55F (12C). You should also shut off and drain the water system. In the event of extreme cold, you might want to also implement the following. Allow warm water to trickle from a faucet on an outside wall (this should actually be done as soon as it gets below freezing). The next tip is to ensure that you keep your thermostat set at the same temperature during both the day and night. If you are in need of professional plumbing services, a back flow preventer, or any other plumbing tools, call Advanced Plumbing at 877-286-8044, or contact us online here. We’re the plumbing experts. Advanced Plumbing offers efficient plumbing services and solutions, up front pricing, and 99.9% customer satisfaction.